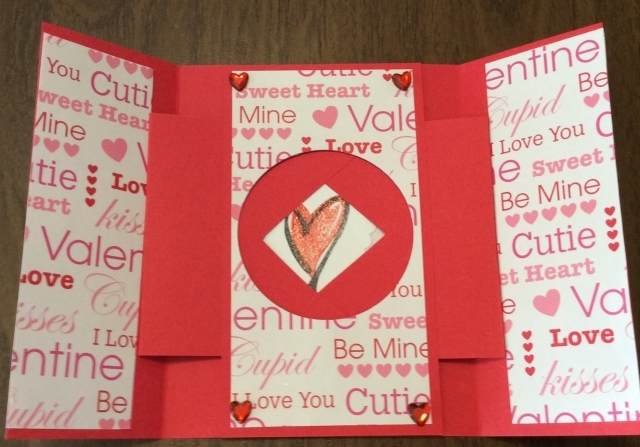 Your challenge is to make a gatefold shutter card to surprise your Valentine. 1. Your card must be a gate fold shutter card with a Valentine theme. 2. You must have either a stamped image or stamped sentiment as the focal point inside the shutter. just somewhere on the front. The belly band is not required, but stamping on front is required. 4. Stamp, paint, or ink your envelope. It can be a simple, uncolored stamped image. Just put something on your envelope. and get your recipient excited to see what's inside. ETA : Combining challenges is allowed. Maria's video and website because she shows how to cut your own banner shape, and her measurements are for an A2 sized card. I also like the way Maria assembled her shutter. Warning, her video moves pretty slowly, fast forward if you need, just to see the shutter assembly. assembly from their photos, or my photo, or just ask for help here in this discussion. Here is Maria Russel's website with measurements. Here is her youtube video..
Another view can be seen on France Martin's website, Stamp & Scrap with Frenchie with a link to her video. I will put the names of all entrants in a basket and draw one to receive a small RAK. My sample shows a birthday card I made for my dad. He's a fan of wolves. opening. I stamped it either on the back of the card base or on a separate piece of cardstock (can't remember). 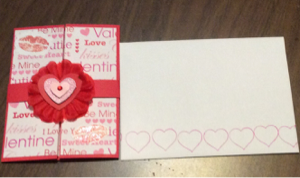 You will attach a picture of the outside of your Valentine and the stamped or painted or inked envelope, either two pictures or in the same picture. This sounds very fun, and definitely a big challenge for me! Thanks for hosting! Cool card. I've never tried one of these before. Very nice sample and what a wonderful video you found explaining this card and its folds. Thank you for hosting. It's not as hard as it looks Heidi, and you might even want to cut panels for more than one card while you have the dimensions up on your screen. very cool, love cards with surprises!! I used LeighAnn's Stamp Your Ground challenge to make the front panels of my Valentine sample for this challenge. Attached are the front of the card, and the front and back of the envelope. I hope you'll try a shutter card! Here is the inside of the card in the gallery. Below is the front of the card and both sides of the envelope. Thank you for looking. Your card is awesome Sadie! I like all of your stamping on printed paper. It turned out great! I'm sorry you had to do this twice. Please put the anniversary card in the gallery too. Sadie, I can't believe you went even as far as the envelope! Your anniversary card is wonderful! I think I have that "Once Upon a Time" set. It makes a great anniversary card. That was such a good idea to use double sided scrapbook paper. Really nice card! Thanks for not giving up and making a second card that IS a Valentine! I did this challenge.i used red cardstock thinking that it would make it easier not to show up mistakes. All it did was make it harder to see. Oh well, I tried. Don't forget, you need to stamp on an envelope for this challenge. You can go back and edit your post if you want and add the picture as an attachment. Here is my entry! Thanks for the fun challenge! I love to learn new folds and fun cards. I have added this one to my list!